There’s nothing typical about teaching and learning in the reimagined classroom. For students in traditional classrooms across the country (and around the globe), the school day can look very similar. Whether in Calgary, Mexico City, or Washington, DC, students shuffle through hallways towards their next class, where they sit in orderly rows, face the teacher standing at the front of the classroom, and study from a scripted scope and sequence crafted by whichever textbook publisher won the latest contract. We believe this paradigm fails students, parents, and teachers. Over the last three years, we’ve designed and refined a new school model for mathematics that meets students where they are and empowers teachers to personalize learning for every student, every day. So, what does a day in the life of a student look like in Teach to One: Math? 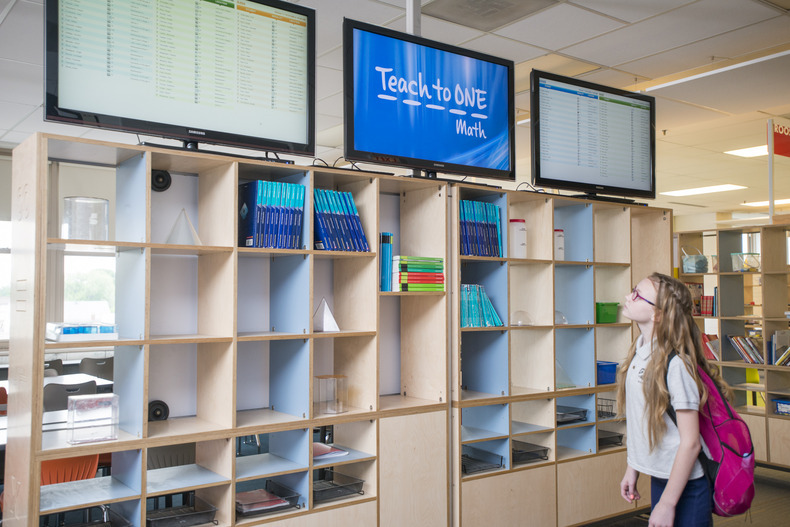 First, students in Teach to One take math in a large, open learning center that looks very different from the traditional 800-square foot classroom. 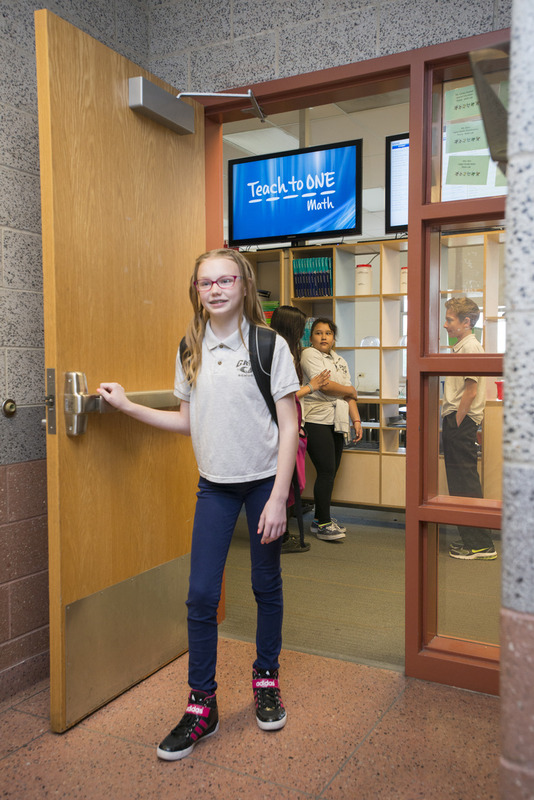 In the math learning center, multiple lessons and learning experiences take place at the same time, enabling students to progress through their personal learning plans concurrently. Students engage with mathematical concepts through multiple instructional approaches or learning modalities: with a teacher, collaborating with peers, or working independently with computer software or a pencil and worksheet. Meet Tracy, a seventh grader. The first thing that Tracy does when she enters the math center is check her daily schedule on the big boards, where she’ll find her schedule for that day. On the boards, she’ll see what area of the math center she’s working in, what teacher she’s working with, and the learning modality she’ll use to experience a new mathematical concept. Today in session one, Tracy spends 35 minutes learning how to factor complex polynomials with Ms. Winterhalter and 15 of her peers in an area of the room called Northwestern. At the end of the first session, music plays throughout the learning center, letting Tracy and other students know that it’s time to move to session two in another part of the room. In the next session, Tracy collaborates with a small group of students on a series of problems with real-world applications. 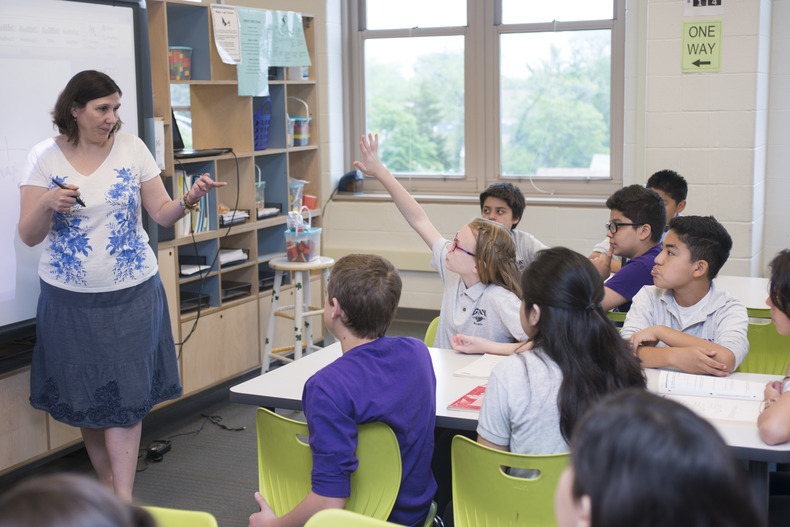 Tracy and the other students get support from Ms. Young, a teacher resident who uses a variety of strategies to encourage discussion, debate, and collaborative problem solving. At the end of her math block, Tracy logs on to the Teach to One portal to take a low-stakes, five-question assessment on factoring complex polynomials. Results from this assessment will inform her schedule for the next day and give teachers information about whether Tracy learned the concepts she experienced. Then, she’s off to her English class with Mr. Jones down the hall. Before the end of the day, New Classrooms’ sophisticated scheduling algorithms will leverage Tracy’s results (and those of her peers) to create a unique and customized schedule for the following day. Teachers are able to access all of the resources and information they need for the next day, to make adjustments that ensure a successful student experience, and to substitute with their own teacher-led lessons when they feel it is appropriate to do so. 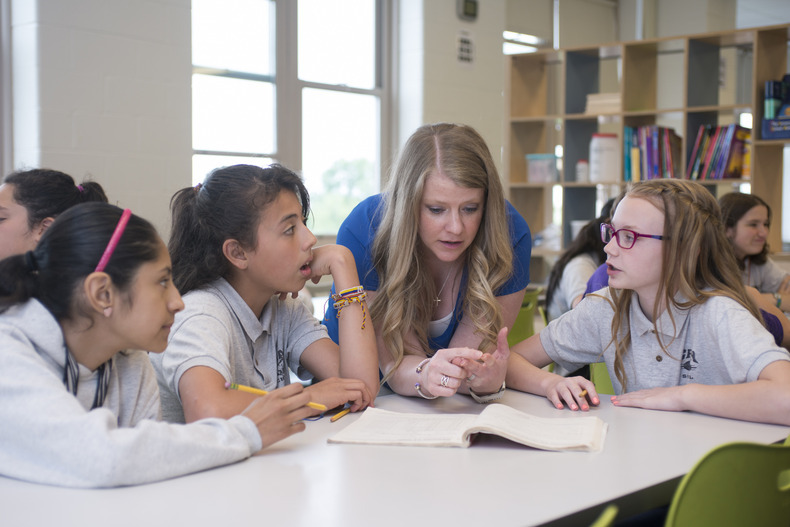 By meeting students where they are, Teach to One is accelerating learning, deepening understanding, and helping students discover the beauty and power of math. Learn more about Teach to One: Math by watching the video below.